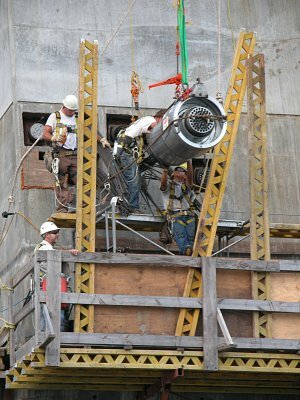 June 6, 2004: 4th Cable Stay (west platform), East side platform extension (resting on the west pylon) and West tendon termination. Note the platform with the blue wheel - for preparing cables to be pulled up the stay pipe. 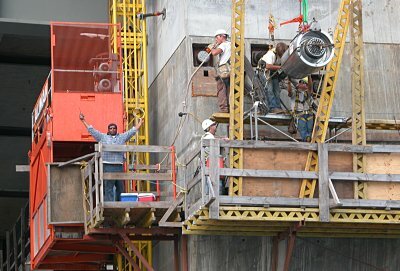 On the left is our team: Rocky (left, emerging from the orange elevator), man-on-break (top middle), two workers (top right) and of course the supervisor, supervising (lower middle). The two workers appear to be threading the individual cables into the termination assembly. On the right is a detailed view of the cable termination housing. Note the individual cables extending out of the end of the termination housing (about 40 individual cables each about 15 mm diameter). "With regards to the ports at the bottom of the photo, these are actually post tensioning cables (actually referred to as tendons). These tendons do exactly what you suggested. They are tensioned to the proper force with the large hydraulic ram you have pictured on your website and I have included below. This ram is only used temporarily and after the proper force is applied a wedge is used to hold that tension in the tendons permanently. I was unable to find a good picture of the actual wedge and tendon arrangement. That tension holds the legs of the tower together and keeps them from "kicking out". As you can imagine, with thousands of tons of concrete and road deck on top of these legs they would tend to spread apart."